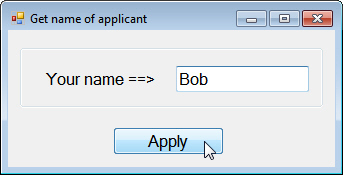 The idea is that you should type in each applicant's name, then click on the button to add this into an underlying array. Checks whether the maximum number of names has been reached (and displays a message if this is the case). Otherwise, adds the name to the array in the next blank position. Displays a message listing all of the members of the array added so far. The message you might see after adding your first 3 names. 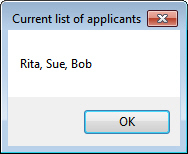 Check that you can't exceed the maximum number of names, then close down your form.